With a series so tightly wound as Homeland season 1, seemingly meant for a self-contained, miniseries-style run, there are two real dangers of extending the story. To extend past shelf life, they could just modify the tail end of the story, dragging resolution on and on, until viewers get tired of being so blatantly manipulated, and the network puts the thing out of its misery. Alternatively, they could grab onto dangling plot threads from the real end of the series and spin a new tangle of twists onto them, giving the appearance, though not the reality, of continuing the original story. Warning: It's completely inappropriate to "jump in" to this show. No summary can be a worthy substitute for seeing it from the beginning. If you haven't seen season 1, check our review to see if it's for you, watch that, and then come back here. I'm not one for spoiler warnings; you should expect to be season-1-spoiled if you read a season-2 review of anything. But you really don't want that here. By the end of "The Smile", Homeland's second season opener, you should be satisfied that this series, unlike so many others, will not be sucked into either of the above American TV clichés. The plot from season 1 continues in an organic way. It would be impossible for everything to stay the same, though, and indeed, much is different, as the writing weaves around the traps for the unwary writer that are so easy for serials in their sophomore year to fall into. There are so many uncertainties left over from the prior finale. Over the course of season 2, most of these resolve into certainties; the universe of Homeland is finally coming into focus. In particular, there is one very satisfying resolution in "The Smile" which forms a template for many of the twists in the following episodes — each inevitable in hindsight, each utterly surprising on first viewing. Some viewers — not including me — had trouble with the action ratio in season 1, perhaps expecting more 24-style antics. They'll be pleased with the increased action in this season. The high point of this season, however is a continuous ten-minute scene of dialogue in episode 5, "Q&A". When that scene ended, I rewound it and watched it again. And then once more. I'm afraid that "Q&A" shone so brightly that its successor, "A Gettysburg Address", couldn't help but be overshadowed, despite having its own share of interesting developments. There's no more theorycrafting from me for this season, as opposed to the last one. Anyway, there's not as much need or opportunity for it. This season, Carrie (Claire Danes, Brokedown Palace, Stardust) is the sane one, and Brody (Damian Lewis, Band of Brothers, Life) the one on edge, his sense of well-being the most important psychological element of the season. Perhaps Carrie can't share that anymore because she leans on Saul (Mandy Patinkin, Dead Like Me, Criminal Minds) so much more in this season — she, along with other characters, comes to understand how valuable he is in their world. One element of disappointment comes from a dropped thread from season one. I expected the relationship between Brody and his daughter, Dana (Morgan Saylor), to be seriously altered by their phone conversation in "Marine One". It has not come out that way, by my observation. Nonetheless, the "family stuff" is really quite good this season, a better estimation than merely "not too bad" as it was in the first. In particular, Jessica (Morena Baccarin, Serenity, V) comes into her own as a character. I mentioned briefly the danger of comparing Homeland to 24, a rule of sound thinking I will now transgress. 24's second season had a problem with not knowing what to do with one character, whose plotline just kind of floated off on a tangent that only intersected back with the main plot after circumnavigating the universe. It was always a chore to watch, and I don't mind accusing Homeland of the same thing, here. It wasn't nearly so bad as that, but that's possibly because Homeland only has 12 episodes to fill in a season, versus 24's 24. Problems aside, if you watched season one and liked it, you're going to watch season two. If you saw season one and were kind of lukewarm on it, try out episode one of this season, at least. If it's changed in one easy-to-understand way, "more straightforward" is how I would choose to describe it. Whether that bodes good or ill for season three remains to be seen. 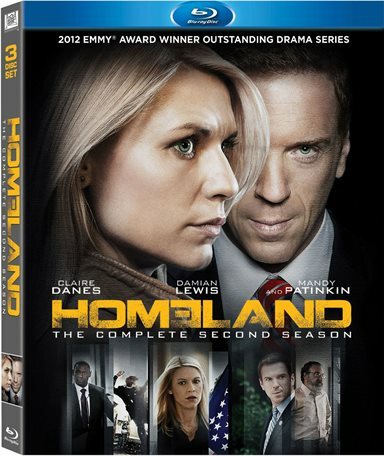 Download Homeland: The Complete Second Season from the iTunes Store in Digial HD. For more information about Homeland visit the FlickDirect Movie Database. Ostensibly a programmer from faraway places, Stephen recognizes that making up your mind about movies and television is a simple matter of imposition in the form of review, and he who controls minds controls the world. No word yet on how that second part is progressing. After seeing many films, a few good, for FlickDirect, he returned to faraway places, but still checks in from time to time. Read more reviews and content by Stephen Compall.